Dark clouds fill the sky, blocking the view of snow-capped Mount Kilimanjaro. Rain pours down on the bustling market in Himo town, about 100 kilometres east of Arusha. Farmers come from all over northern Tanzania to visit the bi-weekly “plant clinic” at the market. Some even travel across the border from neighbouring Kenya. Wilson Mchomvu is an agricultural extension officer, but attends the market as a “crop doctor.” He hangs up a large sign at the entrance to the market. The sign welcomes farmers and invites them to bring their unhealthy crops to his table for a free examination. Kilimanjaro farmer Peter Chambegha enters the market cautiously, stepping through thick mud which collects on the bottom of his shoes. He is carrying a diseased sweet pepper. The crop doctor has office hours every Monday and Thursday. Most of his patients are vegetables, and their symptoms are quite common. As Mr. Mchomvu spreads information booklets and pamphlets with pictures of healthy orange carrots, red tomatoes and onions on his table, Mr. Chambegha greets him and takes a seat. 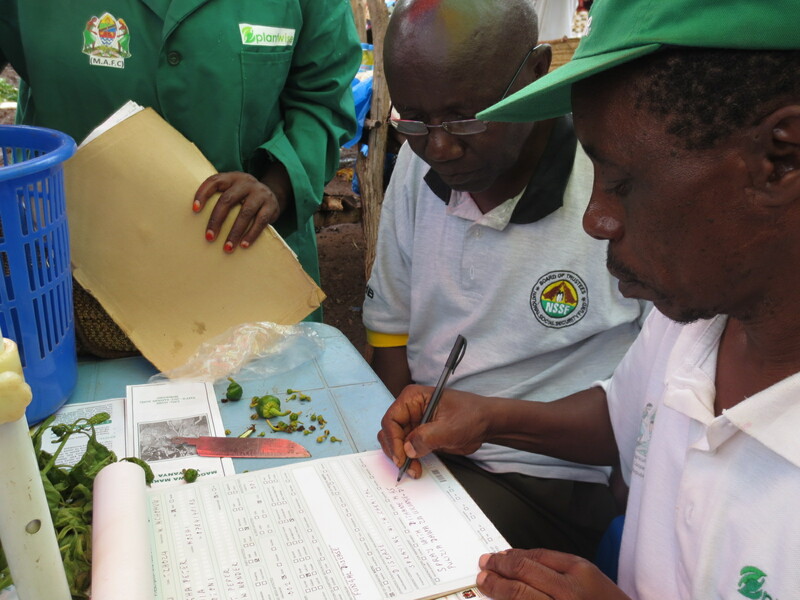 At times the table is crowded with farmers asking questions about the beans, tomatoes and onions they bring for diagnosis. If the crop doctor doesn’t know the cause of the unhealthy crop, he consults information booklets provided by Plantwise. Plantwise is an initiative funded by an organization called CABI in order to improve food security by reducing crop losses. CABI is working to establish plant clinics in 31 countries across Africa, Latin America and Asia. The organization’s spokesperson, Dannie Romney, says CABI is working alongside Tanzania’s Ministry of Agriculture and Irish Aid to establish plant clinics in markets across the country. Ms. Romney expects that plant clinics will flourish. She says farmers find them useful, and that plant clinics increase farmers’ awareness of and interest in other services.